The aircraft carrier HMS INDOMITABLE on the homeward journey from Sydney Harbour to the United Kingdom. On board were men of the British Pacific Fleet who were being demobilised, along with former prisoners of war and women internees from Japanese camps. 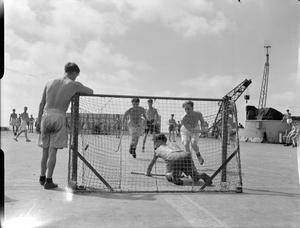 The picture shows a sharp encounter in the goal mouth during a deck hockey match on the flight deck of HMS INDOMITABLE, which was used as a huge sporting facility for the men on the journey back.